It’s been an interesting, and honestly quite difficult week. The Kickstater is still going, and has reached over 2/3 funded. Over the whole period, there have been around 6 out of 80 backers who have had to cancel or reduce their pledges. Kickstarter definitely feels like a drug. The high of seeing the pledge notifications on the phone is balanced with the disillusion of seeing cancelled pledges, or no notifications. There is a lot of anxiety attached to this, which I definitely could not live with on a regular basis I imagine. There have been some additions and changes to designs, testing the three part system, and the methods of interlocking boxes, which have been mostly positive. I have been able to pop boxes to more testers: one to an influencer, who will hopefully post with their famous cat using the box some time soon, at the Treehouse Humane Society, and also at the Catcade. This image above shows the testing with the two different methods of connecting the boxes together—a dovetail push joint, and cardboard “clips”. 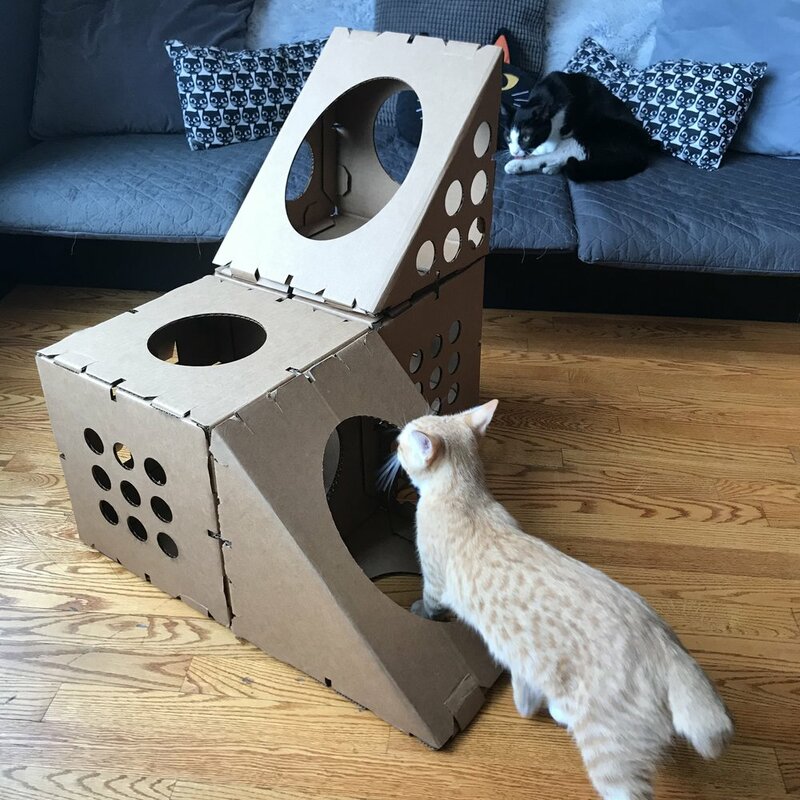 This is a picture from The Catcade on Friday, showing four of the boxes connected together, using the cardboard “clip” method.